This is our collection of Halloween coloring pages. Get in the holiday spirit with these festive printables! Color the most popular Halloween symbols like bats, jack-o'-lanterns, a scary witch, a pumpkin, and a Halloween costume. 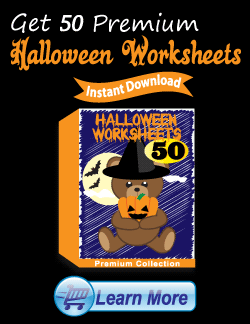 You can get more Halloween worksheets and activities from our free educational website called Kindergarten Worksheets. We also have another educational website with additional printable halloween worksheets for teachers. All of the Halloween coloring printables have been optimized for easy printing. Select the Halloween coloring page you would like to color. This will take you to the corresponding web page. Then you will have two options. I recommend downloading the PDF files of the Halloween coloring pages you choose to color. This will produce optimal results in terms of print quality. PDF files can be easily opened and printed using several free programs. The other print option available to you is printing directly from your browser. This is the fastest way to print the coloring pages but the quality will not be as good as the PDF version. These Halloween coloring pages are a great activity for teachers, parents, and kids. They are best suited for preschool, kindergarten, and first grade level students. You can get Halloween clip art to color at Clip Art Engine.